Apple Music is one of the most popular streaming music services in the world. It was announced on June 8, 2015, and launched on June 30 in over 100 countries worldwide. Apple Music subscribers has been growing tremendously. On April 5, 2019, Apple Music has reportedly passed Spotify in paid subscribers in the US. Here we will introduce each milestone of Apple Music subscribers and also introduce Apple Music Converter to help you convert your favorite Apple Music songs to MP3, M4A for playback on iPod Nano/Shuffle, Sony walkman, various MP3 players, etc. It's no doubt Apple Music is one of the most popular streaming music service and Apple Music subscribers has been increasing. Before joining Apple Music to become a paid user, you'd better to know some essential knowledge. The knowledge also applies to those who has been an Apple Music subscriber without learning much about it. Joining Apple Music means you have the usage right of all the songs in your country, but you don't have the ownership. As long as Apple Music is available in your country and you have a valid payment method, you can apply for 3-month free trial. 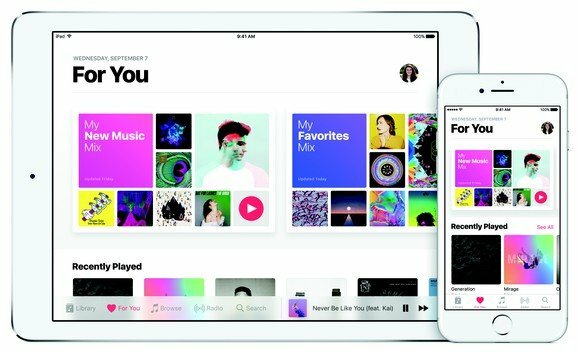 Apple Music is available for Windows 7 or later, Mac 10.9.5 or later, iOS 8.4 or later, Android 4.3 or later and Apple TV 4th or later. All downloaded Apple Music songs are in DRM-protected *.m4p format and associate with your Apple ID. There are three plans of Apple Music: Student Plan ($4.99/month), individual plan ($9.99/month or 99/year) and family plan ($14.99/month for six members). Apple Music uses *.m4p as file extension, AAC encoding and 256kbps audio quality. It's not lossless. Apple Music allows you to download songs on supported devices for offline playback. Apple Music can't be played on iPod Shuffle/Nano/Classic, iPod Touch 4, Sony Walkman, PSP, Kindle Fire or various MP3 players. Apple Music can't be burned to audio CD or MP3 CD. Apple Music can't be used as background music in video editors or DVD creators. Once you unsubscribe Apple Music and the expiration date comes, the downloaded Apple Music songs or playlists will disappear from iTunes library or other devices. Most songs can be downloaded from Apple Music or purchased from iTunes Store, however, part of the songs can be purchased from iTunes store only and part of the songs can be only downloaded from Apple Music. Available Apple Music songs are different in different countries. The amount of Apple Music subscribers is growing all the time. However, the growth speed is now slower than before. Apple Music was announced on June 8, 2015, and launched on June 30, in over 100 countries worldwide. In December 2015, Apple Music has surpassed 10 million subscribers. In December 2016, Apple Music has surpassed 20 million subscribers. In September 2017, Apple Music has surpassed 30 million subscribers. In April 2018, Apple Music has surpassed 40 million subscribers. In May 2018, Apple Music has surpassed 50 million subscribers. In December 2018, Apple Music has surpassed 56 million subscribers. Apple doesn't reveal the detailed amount of Apple Music subscribers since the entry of year 2019. However, On April 5, 2019, Apple Music has reportedly passed Spotify in paid subscribers in the USA according to the report from Wall Street Journal. In February, Apple Music had 28 million paid subscribers in the United States and Spotify had 26 million. However, Spotify still has more subscribers worldwide and more users in the U.S. after counting people on its free tier. Many Apple Music subscribers enjoy the songs, however, many of them may also encounter different problems when they want to play the songs on iPod Nano/Shuffle or other MP3 players, when they want to burn Apple Music to CD or when they want to use a favorite song as background music. From the essential knowledge above, we know that using Apple Music songs directly for those purposes are not allowed. That's why we need Apple Music Converter to convert the songs to MP3 or M4A first. TuneMobie Apple Music Converter is the best Apple Music Converter which can help you convert any downloaded Apple Music songs to MP3, M4A, AIFF, FLAC, AU, AC3, MKA, etc., preserving the ID3 tags like song title, artist, album, genre, track number and artwork. 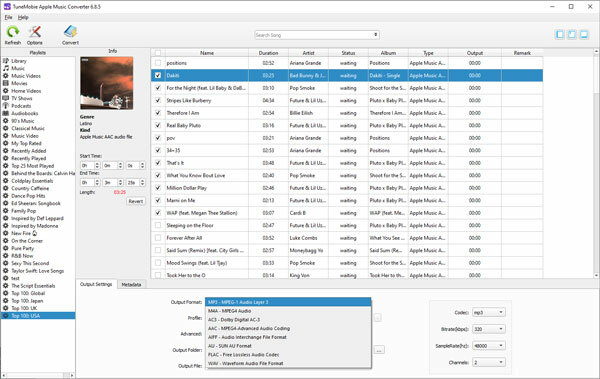 TuneMobie Apple Music Converter also allows you to rename and sort output files by ID3 tags and special characters. TuneMobie Apple Music Converter works perfectly on Windows 7, 8, 8.1 and latest Windows 10, as well as Mac OS X 10.9.5 or above. The conversion speed is up to 16X faster. Besides, it can convert AA/AAX/M4B audiobooks to M4A with chapter information kept, extract audio from iTunes M4V movies, TV shows, music videos and home videos. 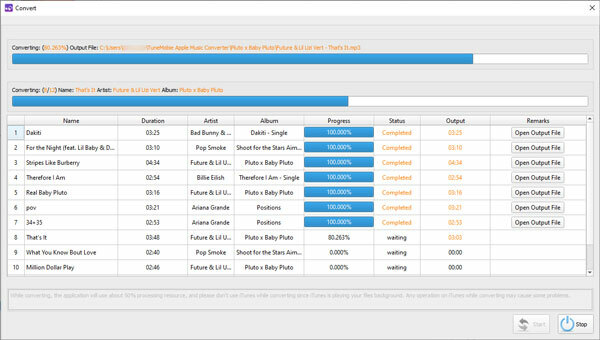 TuneMobie Apple Music Converter is a must-have software program for any Apple Music subscribers. And converting Apple Music songs to MP3 or M4A is very easy and fast. Just follow the steps below. Step 1: Launch TuneMobie Apple Music Converter and iTunes will be automatically launched as well. The songs and playlists will be displayed in the left panel. Step 2: Choose Apple Music songs or playlists, or other supported media files. You can also use built-in search box. Step 3: Choose an output file format and choose audio quality in profile list. The parameters can be customized if necessary. You can also click Options button to adjust conversion speed and specify a rule of renaming and sorting output files by ID3 tags and characters like hyphen, space, underline, etc. Step 4: Click Convert button to start conversion. After conversion, you can click "Open output file" button to locate the output files. Now, you have got your favorite Apple Music songs in versatile MP3 or M4A format and you can enjoy or use them without any limitation. The free trial version of Apple Music Converter can convert 3 minutes of each song. No matter you want to cancel the subscription but keep the songs, or you want to keep using Apple Music, do not hesitate to download it and have a try.